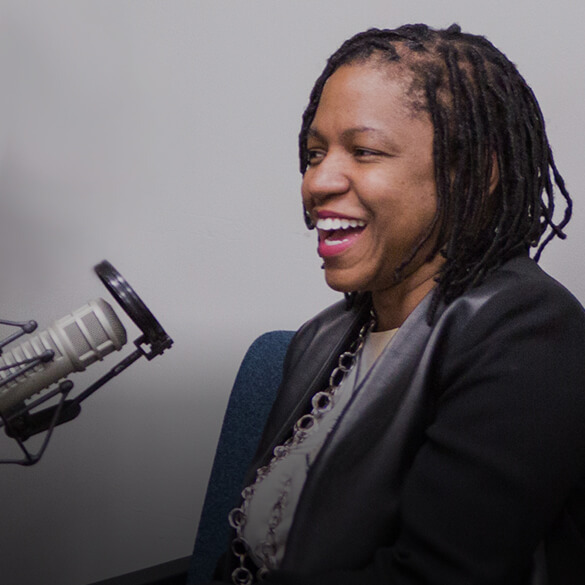 TaskRabbit CEO Stacy Brown-Philpot knows: You can harness the power of the "human cloud" to solve almost any problem — as long as you keep the word “human” in the equation. TaskRabbit's community works with each other, teaches each other, and learns from each other. The result: a transformation in how we work and live. Transcript below. "The community of Taskers — they really take pride in the work that they do. Everybody seeks to get better at something." "The true 'X factor' in any equation for scale is the human variable — and in particular the very human capacity for learning and teaching each other." Stacy Brown-Philpot joined TaskRabbit as chief executive officer in 2013, where she led the successful acquisition of TaskRabbit by Ikea. And since joining, TaskRabbit has doubled its presence in more than 40 markets across the U.S. and the U.K., with plans to expand globally. Prior to joining TaskRabbit, Stacy spent 10 years at Google, where she started the Black Googler Network. DeLashea Strawder is the associate artistic director and the director of music programs at Mosaic Youth Theater of Detroit. Whitney Johnson is an expert on disruptive innovation and personal disruption and the author of several books, including Build an “A” Team: Play To Their Strengths and Lead Them Up the Learning Curve. DELASHEA STRAWDER: The rhythm is …. REID HOFFMAN: That’s DeLashea Strawder. She’s the Director of Music Programs at the Mosaic Youth Theatre in Detroit. STRAWDER: And the song is [singing]: Six times six is 36, six times five is 30 even, six times four is 24, and six times three is 18. Get it. Do the sixes, do the sixes… And so on and so on. HOFFMAN: And she knows the power of a catchy tune. When teachers need help making a lesson “sticky,” she goes into the classroom to inject a little music. STRAWDER: We might make songs that help teach multiplication facts. We might do a rhythm piece that helps young people talk about syllables. Most people learn the alphabet through the ABC song, so it works. HOFFMAN: It’s true, the ABC song is a stone cold classic. Right up there with “I’m Just a Bill” and “Three is a Magic Number.” My personal favorite of DeLashea’s is “Do the Sixes.” There’s just something about the beat. HOFFMAN: …until the chorus grows, expands beyond the school gates, and spreads into the world. Like any good cover band, each individual makes the song their own. DeLashea knows that the possible interpretations are endless. All she has to do is open kids’ ears, and they’ll keep learning, growing, and singing their songs. And others, in turn, will learn from them. All those students need is the opportunity to sing. Where the tune leads them is anyone’s guess. On the face of it, DeLashea’s teaching method is awfully simple: just keep singing. But take a closer look at what DeLashea has figured out. She doesn’t direct her students to take an interest in math or science. She doesn’t force them to memorize and she doesn’t even try to teach them. She knows if she grabs them with a tune, and lets them sing, they’ll all learn for themselves — and then teach each other. Because humans are learning machines. All she has to do is hack their interests with a catchy song. And I’m hoping every tech evangelist out there just perked up at the word “hack.” Because I believe we can hack our way toward a more productive workforce by doing something similar. Just as those students together create a choir of different voices, so is there a workforce — unbound by geography, formed by a multitude of people, waiting to be tapped. You can call it “the human cloud.” It’s a workforce that can teach itself, learn for itself, and discover its hidden talents. And I believe you can harness the power of this human cloud to solve almost any problem — as long as you keep “human” in the equation. HOFFMAN: I’m Reid Hoffman, founder of LinkedIn, investor at Greylock and your host. And I believe you can harness the power of the human cloud to solve almost any problem — as long as you keep “human” in the equation. But before I go farther, let me define my terms… Most of you are familiar with cloud computing. In fact, you’re so familiar with it that you’ve dropped the formalities. You just call it the good ol’ “cloud.” Even if you’re hazy on what the cloud is, you almost certainly use it everyday. Every time you open a Google Doc or use Microsoft Office online, share a file using Dropbox, or share a photo on Instagram, you’re using the cloud. You’re tapping the distributed power of computers across the world to store things and get things done. The human cloud is similar, but instead of tapping the power of distributed computers, you’re tapping into a huge network of people. Like computers in the cloud, they’re out there, waiting to be assigned a role. TaskRabbit is an example of this. Uber is an example as well. The human cloud has extraordinary potential. But it’s more complex than a network of computers. And trickier to harness. Because humans are not robots, they are not a fixed variable. They’re different from each other. And miraculously, they change over time. That’s why the true “X factor” in any equation for scale is the human variable — and in particular the very human capacity for learning and teaching each other. I wanted to talk to Stacy Brown-Philpot about this, because no one I’ve met has thought more about how you harness the human cloud. Stacy is the CEO of TaskRabbit, the website where anyone can be hired to complete jobs, ranging from simple to complex. Stacy is acutely aware of the humans that make up the human cloud — and how to help them reach their potential. She’s also seen the costs of not doing so. For her, it’s personal. STACY BROWN-PHILPOT: I grew up on the west side of Detroit. It wasn’t the best neighborhood, it wasn’t the worst neighborhood, but people looked out for each other. Of course, later on, things got worse for a lot of people very, very fast, but it was home for me. HOFFMAN: The Motor City was struggling as the auto industry’s engine faltered and died. Times were tough. Communities were devastated by unemployment and despair. Stacy got an unflinching look at this reality from her very first job: the paper route. Stacy shared hers with her older brother. BROWN-PHILPOT: We would deliver the papers in the mornings, and then on the weekends we had to go collect from people. Of course, there was always people who didn’t want to pay, so I had to make sure we got paid. HOFFMAN: How old were you then? BROWN-PHILPOT: Oh, I was about 10 years old. HOFFMAN: How did you get people to pay? BROWN-PHILPOT: Well, you just knock on their door a lot, and often, and then you kind of watch when people’s cars would pull up, and see them going in the house, and you run out and catch them before they close the door. And then I’m 10, so of course they’re going to look at me and say, “I need to give Stacy her money.” But sometimes they just wouldn’t answer the door if they didn’t have it, so you have to watch people when they go into their house. HOFFMAN: Most people would agree that stiffing a 10-year-old girl out of her paper route money is a jerk move. But Stacy wasn’t deterred. BROWN-PHILPOT: Some people would see us and it’s like, four degrees outside, and they would just give us that extra dollar. That just meant so much, because I know it came from people who didn’t have a whole lot of money, but they were proud of us for doing real work, good work, legal work, in a community where a lot of people did illegal work to make money. I think that helped inspire me probably later on, that if you do good work for good people, it’ll pay off. HOFFMAN: But there was a less sentimental reason that drove Stacy to lug heavy bags of paper through freezing Detroit streets. BROWN-PHILPOT: I liked to buy candy. HOFFMAN: Cash equals candy. It’s a fun equation you learn as a kid. But Stacy learned some tougher lessons too. BROWN-PHILPOT: I would say that my upbringing in Detroit taught me grit. It taught me about not just the cold weather, but there’s a community that needs to thrive, and you need to figure out a way. HOFFMAN: Stacy found her way from her childhood in Detroit to college at Wharton, investment banking, and business school at Stanford. With her MBA in hand, she applied for a job with Google. BROWN-PHILPOT: Thirteen interviews later, I decided that this was probably one of the best set of people I’ve ever met in my whole life, and that these are the kind of people I want to learn from. HOFFMAN: But something was missing. Stacy’s high school had been 98% African-American. At Stanford and then Google, she found herself part of a vanishingly small minority. Why were there so few black people in the tech industry? What could be done to tap the huge pool of talent she knew existed? She took those questions to her then-boss at Google, Sheryl Sandberg. HOFFMAN: True to form, Sheryl Sandberg got Stacy to “lean in.” And Stacy’s initial effort was decidedly minimalist – a simple email chain. BROWN-PHILPOT: I added all the black people that I knew and I told them to add all the black people that they knew. HOFFMAN: This initial move was as low-tech as it gets. But watch how the the power of the human cloud kicks in. Recipients forwarded the email to their contacts, who in turn forwarded it on to theirs. The conversation grew. BROWN-PHILPOT: All of a sudden we were a club that then formalized into not just about recruiting, but we wanted to attract, we wanted to introduce people to the concept of working in tech, we wanted to retain people, we wanted to build community. HOFFMAN: That club became the Black Googler Network. It pioneered schemes to reach out to talented black students who otherwise may have missed out on a career in tech. It was one of Stacy’s first experiments in tapping pools of talent who sit outside the stream of opportunities. Stacy’s time at Google took an unexpected detour — to India. Part of her job in India was to make Google’s ad platform smarter. BROWN-PHILPOT: The India team used to approve all the ads that showed up on Google and it’s literally a person that had to go: “Yes, no, yes, no.” And finally, we were teaching the machine to do: “Yes, no, yes, no.” But at some point, there’s just some judgment about what’s on this page that the machine just can’t learn. HOFFMAN: Most people assume that what’s served by Google and other platforms is all technology, all servers.They don’t realize the intensity of the human engine behind it. It was this human engine Stacy was building in India. BROWN-PHILPOT: You assume that all automation is possible, and when you’re sitting in Silicon Valley, you have that mindset that everything can and should be automated, and our entire lives will be more efficient because of it, and that was the moment when we learned that there has to be some human judgment somewhere in society. Otherwise, we will make bad decisions. We talk a lot about technology teaching us how to be smarter, but I still believe that there’s human beings who just teach technology how to be smarter. I think that’s an important concept that we took later to TaskRabbit. HOFFMAN: She was starting to explore the essential role that human intelligence plays in artificial intelligence. But her time in India also taught her a more subtle lesson about human nature. HOFFMAN: When Stacy says “one-on-ones,” she’s talking about the one-on-one meetings with employees who report to her. BROWN-PHILPOT: And I’d have the 10 things that I wanted to accomplish and then I’d get through the first one and feel frustrated that we didn’t get through the nine other things. HOFFMAN: On one level, Stacy was learning what every thoughtful executive learns when they work inside another culture: things don’t always work the way you expect them to. BROWN-PHILPOT: I had that same meeting with the same person the next week and just get more and more frustrated, but what I needed to learn, faster than I learned at that time, was that this meeting is not about you, Stacy. This meeting is about the person that you’re leading, and that person needs to talk for 25 minutes in the 30-minute meeting in order to be effective in their job. Seeing more of what I needed to do to help others be successful, than what I needed to do to be successful, I had to get hit over the head with that many, many times before it worked. HOFFMAN: That’s a great lesson. HOFFMAN: The lesson here is more profound than just a cultural exchange. Stacy was learning something essential about humans and how to get the best out of them: As a manager, your job isn’t just to direct your employees or drive their To Do list. Your job is turn the light on inside them. With her task lists and efficiencies, Stacy had forgotten there was a human in the equation. And so many managers and organizations still do this today. We unknowingly treat our teams like an assembly line — units of work to accomplish tasks. We create systems based on efficiency. And rationality. But humans aren’t always rational or efficient. At least not the way a machine is. And that’s a good thing. Unlike actual machines — which have to be coaxed into learning — people will often spontaneously teach each other, and themselves, if you give them a chance. A new book zeroes in on just this point. It’s called “Build An A Team” and it’s written by disruptive innovation expert Whitney Johnson. She’s helped countless founders lean into learning. WHITNEY JOHNSON: I think we all mean to be a great boss. We mean to be a place that people love to work. The problem is that this on-the-job development gets lost in the day-to-day chaos. So then people get bored and stuck, and then they stagnate and because they’re stagnating so does your organization. HOFFMAN: Of course, no one intends to let their employees stagnate. What happens is that the better they are, the more you need them to keep doing what they’re doing. JOHNSON: You want people to stay. You want them to stay right where they’re going to do you the most good, but if you’re going to have an organization where learning is taking place and engagement’s taking place, and you’re avoiding getting disrupted, recognize that you and every person on your team is a learning machine. You want the challenge of not knowing how to do something, then learning how to do it and mastering it, and then learning something new. Basically, you, me, everyone, we want to learn and leap and then repeat. HOFFMAN: Learn. Leap. Repeat. It’s a formula for innovative companies and satisfied employees. As we’ll soon see, it’s also the formula for the human cloud. But that’s getting ahead of our story. Stacy just returned from her tour of duty in India — turning over these new ideas about motivating and maximizing human behavior. She came back to Google HQ. Back to the confining familiarity of her executive suite. HOFFMAN: As luck would have it. She met Leah Busque. Leah was the founder of TaskRabbit. And she was searching for a new Chief Operating Officer. Stacy had tried the service out and loved it. In 2013, she joined TaskRabbit. BROWN-PHILPOT: I’m a mission-minded person. We talk a lot in Silicon Valley about missionaries and mercenaries, and I’m definitely in the missionary bucket. Google’s mission to organize the world’s information was… Wow, that’s huge. I could do that for the rest of my life. But TaskRabbit’s mission around revolutionizing everyday work really grabbed me, and it brought me back home to Detroit. It brought me back to the people who were good, hard-working people who lost their jobs because of the failure of an entire industry, who couldn’t find work but had strong work ethics, and here’s this great little app that is doing that. HOFFMAN: When Stacy joined TaskRabbit, it was a website and app where anyone can hire — and be hired — to take on simple and not-so-simple tasks. BROWN-PHILPOT: TaskRabbit was eBay for services when I joined. Anybody can do anything, get anything that they want. HOFFMAN: And what did they want? Let us count the ways. There are the obvious tasks: scrubbing grime off the stove so you can get your security deposit back. Helping move that ugly, heavy dresser out of sight into a spare room. Washing a prize show piglet. Steam cleaning Weird Al Yankovic’s stage outfits. No, I’m not making any of those up. They have all appeared on TaskRabbit, and they’ve all been completed by “Taskers,” as their freelance, all-purpose workers are affectionately known. I couldn’t resist asking Stacy about the strangest task she’s seen a Tasker be tasked with. BROWN-PHILPOT: It was the “Impersonate my best friend at the birthday party.” This got coverage in L.A. on TV, and it’s no shock it’s like L.A., right? HOFFMAN: No, you didn’t mis-hear that. A tasker was hired to attend a birthday party, and convincingly impersonate the guest of honor’s best friend. We tracked down that Tasker. Her name’s DaVette See. DAVETTE SEE: So, I guess my most famous task, the one most people know about, is the time I was hired to impersonate someone at their friend’s birthday party. That was pretty crazy. So Riss hired me to go to Holly’s birthday party as Riss. Because Riss couldn’t make it, that was Riss’ answer was to send somebody as her, as Riss. I mean, there was no hesitance on my part, I once I read it I was like, “This was custom made for me.” We didn’t look anything like alike. There’s like 20 year gap in age, there’s race difference, I’m black, she’s not. So, there was another friend and she was going to be the one who called me by Riss’ name when I walked in. The friend announced, it’s like, “Oh, Riss, I’m so glad you could make it.” And I said, “Yeah, surprise.” And then there was just this moment of shock and then there was just laughter because it was just the kind of thing Riss would do apparently. HOFFMAN: Taskrabbit sounded like a blast right? For clients, it was like having a digital genie in your cell phone who could make all your wishes come true. For Taskers like DaVette, it meant every day was an adventure. But the free-wheeling system had severe limitations. Taskers had to go through this bidding process for every task. Many found themselves in a race-to-the-bottom to offer the cheapest prices. CLIENT VOICE: Alright everyone, I got this prize piglet here that needs some serious washing. Now, he’s pretty squirmy, very dirty, and he doesn’t like strangers very much. Oh, and you’re gonna have to catch him yourself. TASKER 1: I’ll do it for $20! TASKER 2: Pass that porker to me – I’ll clean him for $15! TASKER 3: I’ll do it for !10. I’ll even dress him in one of Weird Al’s shirts, left over from my last job. No extra charge! HOFFMAN: This bidding system — which could be such a source of excitement for some, was exhausting to others. It took too much time to go through all those bids and choose a winner. And the open-ended, “anything goes” framework set many clients up for disappointment. BROWN-PHILPOT: Fifty percent of the people had a bad experience, and they told 10 times more people than the people who had a good experience. That just wasn’t going to work for the long term. HOFFMAN: A 50/50 chance that each of your new customers will have a bad experience? You don’t need to be a master mathematician or a master of scale to know that’s bad news. To fix the system, Stacy and her team would need to re-think how TaskRabbit worked. They came up with a plan. The types of tasks people could offer were narrowed to four categories: handyman work, home cleaning, moving help, and personal assistant. Taskers could set when, and where, and how they wanted to work. They could specify their hourly rates. No one could charge below a minimum rate. And they would no longer would they have to anxiously check their phones in case they were outbid on a potential task. As for Clients, they would be able to book a Tasker in a single visit to the site or app. No more scrolling through long lists of bids. Instead, Clients would be presented with a shortlist of recommended Taskers based on their rates, reviews, and skills. Stacy and her team wanted to test the new system in virgin territory. Some place people had not used TaskRabbit before. This way, reaction to the new system would be untarnished. BROWN-PHILPOT: We tested it in London because they don’t know what TaskRabbit is and how it works. They’ve heard of it, and lots of people were in London and wanted TaskRabbit to be there, but they didn’t know what the product was. HOFFMAN: The Brits loved it. BROWN-PHILPOT: The assignment rate went up, our close rate went up to over 80%, not 50% anymore. We knew that we were on to something, and then we brought it back to the U.S.
HOFFMAN: If the Brits loved it, then the Americans would immediately take to it, right? Well, not exactly. Changing an existing system is never as simple as introducing a new one. And for Taskers in the U.S., the changes went down like a warm beer on a rainy London afternoon. The problem wasn’t necessarily the change itself, but how they heard about it. BROWN-PHILPOT: We told them the same day that we told TechCrunch and USA Today and all of our clients, everybody, and that was a mistake because they revolted, and they were upset, mostly because we didn’t tell them that we were going to do this, some because some people weren’t going to have work anymore, and they were going to have work in a different way. HOFFMAN: What happened to Stacy is a classic mistake. One that many of you listening have probably also made. And if you haven’t — listen closely. It could save you some serious pain. Stacy had implemented an objectively positive program at TaskRabbit — one that she knew would change the Taskers lives for the better, and make her customers more happy too. But she forgot to tell them about it. And by letting them learn about the news in the press, she undermined their sense of investment. TaskRabbit isn’t just a company, it’s a community, where people feel a sense of ownership. And when people feel ownership, they expect to have input… or at least learn about the news before they read it online. If you’re selling toilet paper, your customers are on the consumer end of that spectrum. Sure, they use your product everyday. But they’re not super invested in your cult of personal hygiene. But the more users feel their identities and economics are invested in your product, then you are no longer the sole proprietor. Your users are owners too. They may not hold equity or have a parking space in your office lot. But they are part owners in the brand, and that’s always the case whether you’re a community or a network or a marketplace. The reaction of the Taskers had blindsided Stacy and her team. They had forgotten the very human connection they had to this workforce. But there was another issue. One they had predicted. And it was made worse by the ongoing user revolt. BROWN-PHILPOT: We knew that we were going to lose money the day after we made this decision. We didn’t know for how long before the recovery would happen. For the period where we think that we are going to be in this slump before we recover, we’re going to have to all be okay, as a leadership team, that this is happening, and nobody can fake. Nobody. HOFFMAN: There could be no retreat. Now Stacy and her team were in a foxhole. And they had to hold position. With artillery shells whistling over their heads. The ground shaking beneath their feet. Casualties mounting. But they had to hold their nerve until the offensive passed, or they stood to lose everything. At first, they lost revenue and users. The wide-ranging changes had put off many people, both Taskers and Clients. The narrowing of the task categories also caused a downturn in business. But over time, the new system yielded happier users. Eventually, the turnaround worked. BROWN-PHILPOT: I’m really glad that we stuck to our guns, but it took a lot of courage for us to do that, and the lesson there is, you’ve got to have a plan if things don’t work out, but you’ve got to be willing to stick to the plan, because sometimes it will, and most times it will. HOFFMAN: The tough transition was behind them. And now something really interesting was happening. Having eliminated the most competitive aspects of the Taskrabbit system — where taskers had literally been bidding against each other — something curious happened. TASKER: Hey guys, Tim here. Today I’m going to teach how to unclog drain. TASKER: Hey, I’m Jess. And this is how you hang a picture frame. TASKER: Here’s how you install a light fixture. HOFFMAN: Taskers started teaching each other. They started holding classes and posting videos to teach each other skills and increase each other’s earning power. It’s a stunning example of what happens when you allow a human cloud to be human. It might start spontaneously and continuously improving itself. BROWN-PHILPOT: The community of Taskers, they really take pride in the work that they do, everybody seeks to get better at something. I might be naïve in saying that, but all of us seek to get better at something. HOFFMAN: Particularly enterprising Taskers sought out and identified new customer needs. They then developed new skills to address them, and shared these with the community. It became a self-reinforcing loop that everyone benefited from. BROWN-PHILPOT: We’ve actually harnessed the power of the community to do a lot of the training and development. If I want to learn how to drill a hole in a brick wall, I can charge $5 more per hour, and so someone organizes a virtual session or a live session, I can go to that. HOFFMAN: Drilling is just the beginning. BROWN-PHILPOT: Drill holes into brick walls, how to mount a TV with the wires hidden, trampolines, Christmas toys. In fact, I got one, which is like a little car, for my kids, and they’ll teach each other about the tricks and tips on how to do that. As you can imagine, there are extremely good Ikea furniture assemblers on TaskRabbit who can put things together in like 20 minutes that would take two hour. HOFFMAN: What happened was that once the hyper-competitive bidding structure was removed, a supportive community of Taskers emerged. They teach each other skills. Increase one another’s earning power. In a narrow, self-interested sense, this doesn’t exactly make sense. In theory, taskers were still in competition with each other for jobs. But this is exactly this kind of wonderful expansion that you find in the human cloud. It’s what happens when you keep humans in the equation. They find a way to positive sum games. Where one plus one isn’t two, but maybe is four or five. Because as they help each other, it becomes a dynamic, evolving positive sum system that helps everyone a lot more. The pie grows. You can’t quantify the impact of what that is, and the power of community, but it’s really helped, we’ve created this self-enabling way for people to learn and earn in the marketplace. HOFFMAN: And I’ve thought a lot about recursive loops relative to people as part of the social network loop. You know, the LinkedIn loop, the Facebook loop. The benefit of loops is they compound. So the simplest loop that’s described a lot is the virality loop: I send out two invitations and one of them is answered and that person sends out another 2.1 invitations. Then you have an exponential curve up and you can get to massive numbers very quickly. So then you go, “Okay, when you’re tieing human factors and human decision into the loop, even though the time coefficient is slower, the impact of adapting a human network, a human cloud, may be so fundamentally important. Because it’s changing economic potentiality, because the real key question is: how do we use technology to enable many more middle class jobs.” It’s one of the things I’ve been thinking intensely about. HOFFMAN: Stacy is thinking intensely about how to encourage more self-reinforcing loops, and more great talent pools. BROWN-PHILPOT: A lot of what we’re trying to do with the future of work is make it very easy for people to access work opportunities. Inside of TaskRabbit, what about the app experience can we do to make it so that someone who doesn’t have a high school education or a college degree can easily download this app, enter in some information about themselves and be ready to accept and decline work? So we’re spending a lot of time thinking about: how do we make this technology simpler? How do we make TaskRabbit more accessible to more people and more affordable? HOFFMAN: My conversation with Stacy really got me thinking about this human micro-entrepreneur loop — and what kinds of companies, and tools, and data might amplify it. The creation of good and fulfilling middle class jobs is one of the most important goals we can collectively focus on. And that’s the kind of future I can get behind.